Reporters Committee Executive Director Bruce D. Brown (right) was a panelist at the Dec. 15, 2014 Electronic Privacy Press Event hosted by Microsoft in New York City. Panelists discussed their stand against a U.S. judge’s order that Microsoft give up emails stored at its data center in Ireland. The Reporters Committee was one of several organizations signing on to legal briefs against disclosure. Available on the Microsoft website are: a webcast of the discussion; legal documents relating to the case; and a blogpost by Brad Smith, Microsoft general counsel and executive vice president, legal and corporate affairs, explaining the issue. “Fair warning, all ye who interfere with newsgathering: The Reporters Committee for Freedom of the Press is getting ready to sue you. Reporters Committee Legal Defense Director Gregg Leslie was among the speakers Aug. 14, 2014 at a National Press Club briefing about the subpoena of New York Times reporter James Risen. The event was covered by C-SPAN, which has posted the video on its website. You can also read coverage by the Reporters Committee online here, by McClatchy’s Washington Bureau here, and by Politico here. 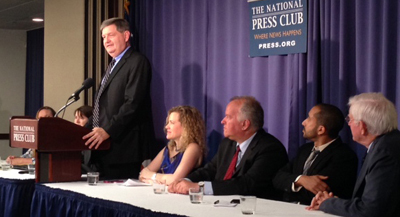 New York Times reporter James Risen speaks at the National Press Club briefing. Joining him, from the right, are television host and journalist Phil Donahue; Ahmed Ghappour, outside counsel, Freedom of the Press Foundation; Gregg Leslie, legal defense director, Reporters Committee for Freedom of the Press; and Jesselyn Radack, director of national security & human rights, Government Accountability Project. Seated to Risen’s right but not pictured are Norman Solomon, co-founder, RootsActions.org, and executive director, Institute for Public Accuracy; Delphine Halgand, director of the Washington office, Reporters Without Borders; and Courtney Radsch, advocacy director, Committee to Protect Journalists. Bruce Brown and Clarissa Pintado have co-authored an article, “The Small Steps of the SPEECH Act,” for the Virginia Journal of International Law, published March 19, 2014. The summary is available online, as is a PDF of the entire paper. The Reporters Committee for Freedom of the Press has joined the Coalition for Court Transparency (CCT), a group of media and legal organizations focused on urging the U.S. Supreme Court to allow live video of oral arguments. In conjunction with CCT’s announcement, comes the launch of a 30-second television ad titled “Everywhere,” that will run some 300 times in the Washington, D.C., market on cable news outlets including CNBC, CNN, Fox News Channel and MSNBC through March 10. The ad can be viewed on the newly launched OpenSCOTUS.com website, where people can join a petition to Chief Justice John Roberts urging him to open the Court to camera coverage.